2019 Season Opens in May! 203 S. Washington is our address. ​You'll find us under the blue, yellow, and white outdoor pavilion at the SVRC Marketplace. We are EXCITED with our "new digs" and want to keep our vendors and customers updated on changes. Please check back to this page as it's updated. We've still got a lot of work to do before we welcome you this season. Downtown Saginaw Farmers' Market location is 203 S. Washington Avenue in the outdoor pavilion at the SVRC Marketplace. We will continue to be YOUR seasonal farmer's market in downtown Saginaw. COMING SOON; Pictures and new information about our permanent home! ​Wondering what's in season or how to cook a certain vegetable? Then check out this great resource from our friends at Michigan Fresh, an extension of Michigan State University. Looking for a way to help the Market continue to grow? ​Consider a donation to the Downtown Saginaw Farmers' Market! Welcome to a new year with the Downtown Saginaw Farmers' Market! We are EXCITED to be part of the positive changes being made to the downtown Saginaw area, and helping to make the Great Lakes Bay Region aware of what it takes to make these changes happen. Whether it's flyers, radio spots, booking entertainment at Market, or making our Community Table available for other non-profits in our area -- it takes resources and dollars to make this happen. As little as $1.00 to thousands of dollars helps the DSFM, a 501(c)3 non-profit corporation, available to all of YOU -- our patrons, customers, vendors, and friends. Please scroll down on this page and "click" on the PayPal icon to donate what you can to help the DSFM continue to grow and serve the Great Lakes Bay Region. All donations are tax deductible. Click here to learn more! Do you have farm products - vegetables, fruit, meats, eggs, plants, cut flowers, herbs, or honey - that you want to sell at market there are opportunities for seasonal vendors to sell at the Downtown Saginaw Farmers' Market from May-October under our tents and in the future, under our pavilion at the SVRC Marketplace. Want to Sell Outside Seasonally with DSFM, May-Oct? This directs you to the Downtown Saginaw Farmers' Market vendor forms and information! Please take a look at our rules and regulations. Want to Sell Inside SVRC Marketplace, Year-Round? This directs you to the SVRC Marketplace website and contact information for the Marketplace Manager! 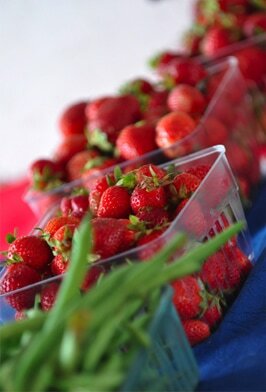 Here at the Market we strive to bring you the best fresh produce, locally grown from Michigan and around the world! Whether you need fresh fruits, vegetables, herbs, cut flower bouquets, organic handmade soaps, honey, delicious pies, cakes, cookies, brownies, incredible chocolates, caramel corn, jams & jellies, or just want to stop for lunch, you will find great foods from area vendors. Find us on Facebook or follow this map to our location!!! We are a downtown gathering place and destination providing an important link for our community to local agriculture and fresh healthy produce. Find out all about us, our vendors, and our history.